Last week was completely exhausting for me — and for many others, too. It was the annual madness of the United Nations General Assembly Ministerial Week, where a record number of world leaders descended on Manhattan’s Turtle Bay, bringing heavy security (and traffic jams), and discussing issues like Syria, Iran’s nuclear program, achieving the Millennium Development Goals by 2015 (and what comes after), climate change and global counter-terrorism, among many others. I was in the thick of it all week, chasing Presidents, Ministers and media; when Friday arrived, I couldn’t leave NYC soon enough to head up to the country. And my immediate destination for a restorative repast? 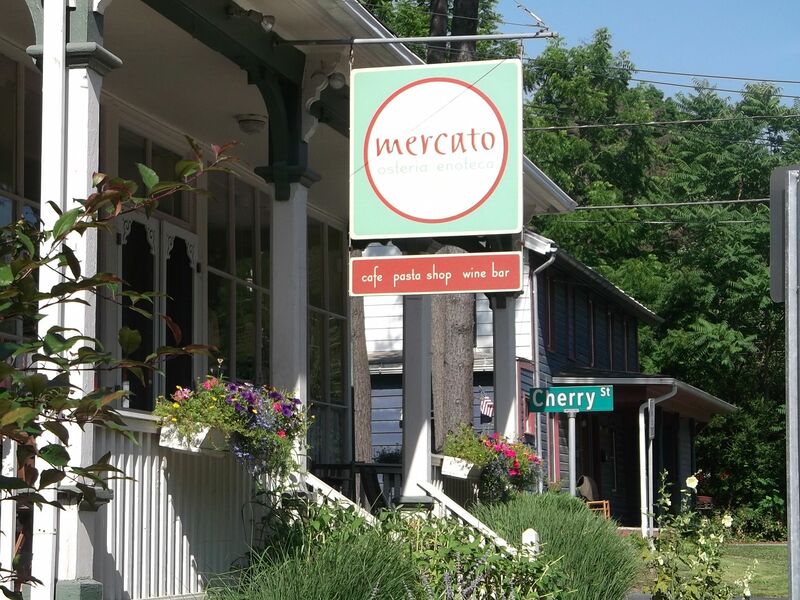 Mercato Osteria & Enoteca, our go-to boite upstate. Bleary-eyed and famished, I rolled into Mercato, solo (Kathryn was detained in the City), about 9:30 pm. I was immediately informed by Brooke, Mercato’s manager, that some dishes had sold out, including one of my favorites, the Pappardelle with Rabbit Ragu. Disappointed, but no less hungry, I settled on the Ravioli with Brown Butter and Sage Sauce, and ordered a glass of Etna Bianco. Not five minutes later, however, good news arrived: anticipating my late appearance — and knowing of my hellish week — Chef Buitoni had held back a rabbit dish for me! Elated, I turned to the serious business of pairing a wine with the coming treat. One of my favorite things about Mercato is matching Buitoni’s authentic Osteria cooking with his smart, all-Italian wine list; the staff happily (and patiently) indulge me in this. The rabbit ragu starts with a great product: fresh rabbit from Northwind Farms. Located about one mile from our house, Northwind is where we buy most of our poultry and other meats, hormone and antibiotic-free. In addition to the fork tender rabbit, Buitoni uses a classic mirepoix with puréed tomatoes, white wine, herbs and Castelvetrano green olives for the ragu. He then combines the ragu with the long, flat pappardelle noodles, cooked to perfection. Brooke pointed out the Vino Nobilo di Montepulciano from Cantine Dei (2009) as a possibility, a silky, Sangiovese-based wine from Tuscany, where they eat quite a bit of rabbit. Torn, I decided to try them side-by-side with the rabbit dish in order to see which would go best. Seeing the commotion at the bar, Chef Buitoni asked what was going on. Then, naturally, he joined the game. Initially, he voted for the Vino Nobilo, but then he came up with a third, apparently out-of-the-box (white) choice: a Verdicchio (Fattoria Coroncino, Il Bacco 2012), from the Marche, in East-Central Italy. 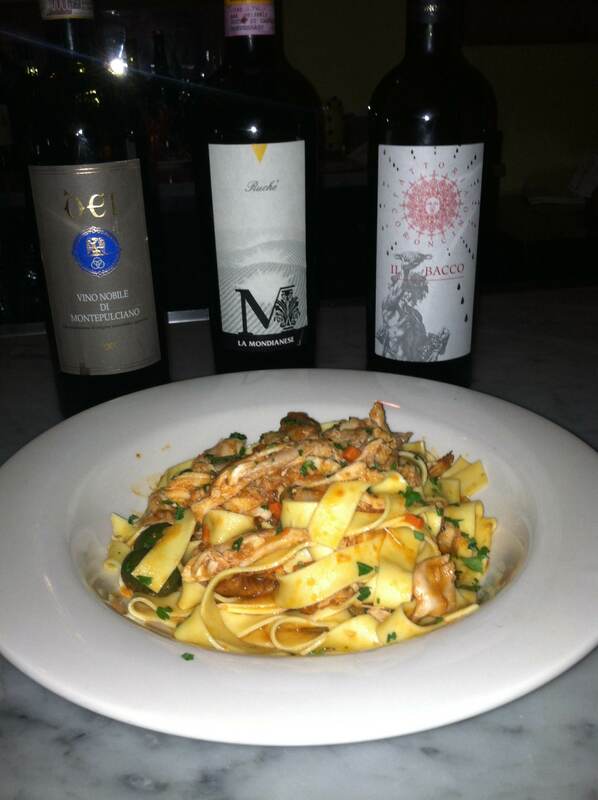 Three excellent wine candidates, one delicious dish. For the record, all the wines were excellent individually and, in a pinch, all three would have worked. The Ruché, however, had an herbal edge and slightly bitter finish that did not quite jibe with the rabbit ragu. The Vino Nobilo was smooth and rounded with dark cherry fruit, but was slightly heavier in body than I would have preferred. The Verdicchio, however, was a perfect match; it’s clean, honeyed straw notes, medium body and balanced acidity melded seamlessly with the white wine and olive elements in the ragu. Simply a knockout. Chalk one up to Chef Buitoni! This entry was posted in Hudson Valley, Hudson Valley Farms, Local Food, Restaurants, Wine, Wine + Food and tagged Cantine Dei, Fattoria Coroncino, Francesco Buitoni, La Mondianese, Mercato Osteria and Enoteca, Northwind Farms, Rabbit Ragu, Ruche, Verdicchio. Bookmark the permalink. Enter your email address below and receive blog updates by email.